As any traveler knows, it’s the serendipity that gets you the bonus points for a trip. The cathedrals, museums, guided walks on the itinerary are all very nice, but the surprises are what makes a trip extra special and memorable. Take our trip to Bath Abbey. We were in this English spa city 33 years ago, and this time we decided to skip the baths, the Jane Austin center and the visit to the crescents in favor of concentrating on the abbey, which we could not remember visiting on the decades-old 1982 trip. Yes, it’s a beautiful church building and does not qualify for a term Bruce came up with: YAC (Yet Another Cathedral). But the surprises within and without were what made the visit special. Start with the engraved stone on the side of the abbey commemorating the death of Sir Isaac Pitman, 1813-1897. Here’s what it said about him: “his aims were steadfast, his mind original, his work prodigious, the achievement world-wide.” So who was he? The engraving described him as the inventor of Pitman’s shorthand, and a docent said there have been many questions about why the engraving isn’t in shorthand. The docent went on to say that Pitman established a phonetic alphabet. So a small surprise, but of interest to someone who has spent his life in print and always wished he had learned shorthand. Sue Symon’s diptych representing Christ walking on water. The bigger surprise inside the abbey was the enjoyment we took from a display of diptychs along the sides of the church. These are double panels with script on the left and an illustrated interpretation of the text on the right. 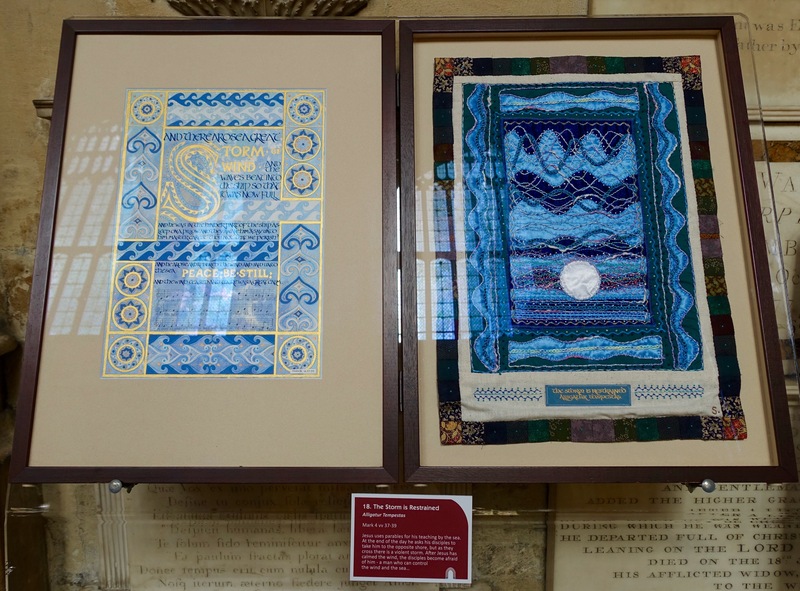 The diptychs at the abbey were created by Sue Symons and are done in needlepoint, gathered cloth, stitching and illuminated calligraphy. While my favorite interpretation of the Gospels comes from Lord Buckley, I appreciated this work as beautiful creations. Stepping outside, more pleasant surprises, including the woman (in the video above) singing a piece from Verdi’s opera La Traviata. 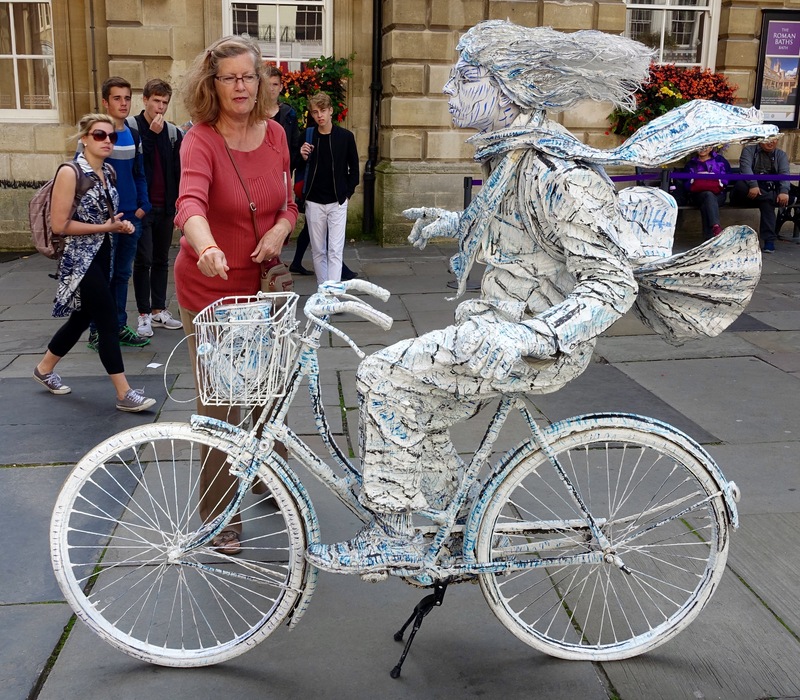 We added some change to her open instrument case and walked on around to the front of the abbey, which is next to the baths, and there was the best human statue I have ever seen. These have become common in many busy spots around the world, people standing rigidly still, often portraying famous individuals or real statues, the Statue of Liberty, for instance. But this one was the first that I actually took for a real inanimate object. Never saw him (Kathy thought it was a woman) move, his/her coat tails never fluttered and his/her bicycle never teetered (it did have a kick stand). I wondered how he/she must feel at the end of the day. Stiff? Wanting to work the willies out? One more pleasant surprise before we left Bath and continued on to Cardiff. Kathy makes a contribution to the best human statue ever. Posted on October 7, 2015 October 8, 2015 by jbsaulPosted in TravelTagged Bath Abbey, diptych, Sir Isaac Pitman, Sue Symon.